Cappadocia is an area in central Turkey that is best known for enormous and complex underground cities, cave churches, houses and hotels carved directly into the rock, and “fairy chimneys” which are tall cone-shaped rock formations stretching upwards of 130 feet into the air. More recently it has become know for the hundreds of hot air balloons that take to the skies every morning at sunrise perfectly complementing the already surreal setting. The landscape of Cappadocia with it’s deep valleys and stunning formations will make you believe you’ve actually traveled to another planet. There is absolutely no where else like it in the world. It is a remote area and not entirely easy to get to – a short plane ride from Istanbul will get you to Kayseri (ASR) and then you’ll need to take a 1 hour shuttle bus into Cappadocia. Kayseri is also accessible by bus or train. If you are adventurous enough to make the trek out to it, you’ll be rewarded with a once-in-a-lifetime modern day fairy tale adventure! Göreme Valley, with it’s deep valleys and fairy chimneys surrounded by mountain ridges was originally formed by massive volcanic eruptions that covered the area in a thick ash. That ash then solidified into a soft rock called tuff which was then eroded by wind and water for centuries leaving behind the interesting rock formations that we see today. In the 4th century it is believed that small anchorite communities saw the honeycombed rock formations and determined to begin inhabiting them be it for protection from the elements or from warring neighbors. In the present day they are the most striking and largest cave-dwelling complexes in the world. Cappadocia is a travelers dream – gorgeous cave hotels carved directly into the rock and delectable cuisine on every corner. Where you choose to dine and sleep can be a difficult decision. 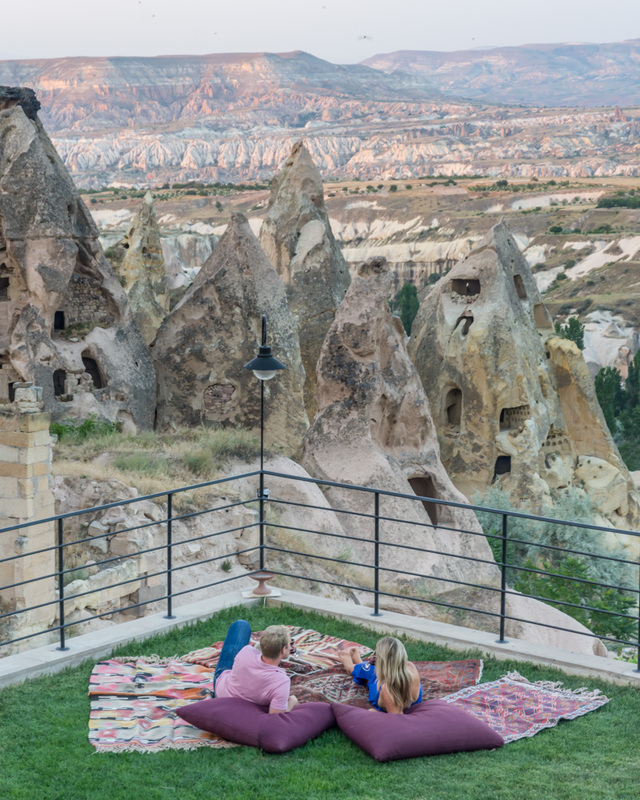 Taskonaklar is a boutique-style cave hotel located just outside of Göreme in the small historic town of Uçhisar. The land surrounding Taskonaklar was purchased originally as ancient cave ruins and the architect kept the integrity of the original rooms in the present-day design. While Göreme is more of a busy backpacker scene, Uçhisar is home to upscale boutique hotels and offers the best views of Cappadocia in the region. The town is quiet and quaint with delicious local fare and friendly locals, and is only a short ride to Göreme. Each cave room at Taskonaklar is different and unique and will make you feel as though you are actually sleeping in an ancient cave, but with all the modern day conveniences. Intricate stone work and antique furniture create the foundation of each room while luxurious bedding and traditional decor give it flare. Whether you choose a standard room or a deluxe room complete with private jacuzzi tub, you will be in awe of all the carefully constructed details in every corner. The cave bathrooms are all different but each is an architectural masterpiece. Rooms are equipped with their own wifi, tv, air conditioning, coffee maker, and fun goodies like loofas, slippers, scrumptious-smelling soaps and lotions, and wine in the mini bar. Some rooms offer fireplaces and each has it’s own private patio area, some more grandiose than others but all offering fantastic views and comfortable seating. Begin each day of your stay at dawn – sit on the lovely garden terrace overlooking Pigeon Valley and soak in the sunrise while hot air balloons lazily float by. 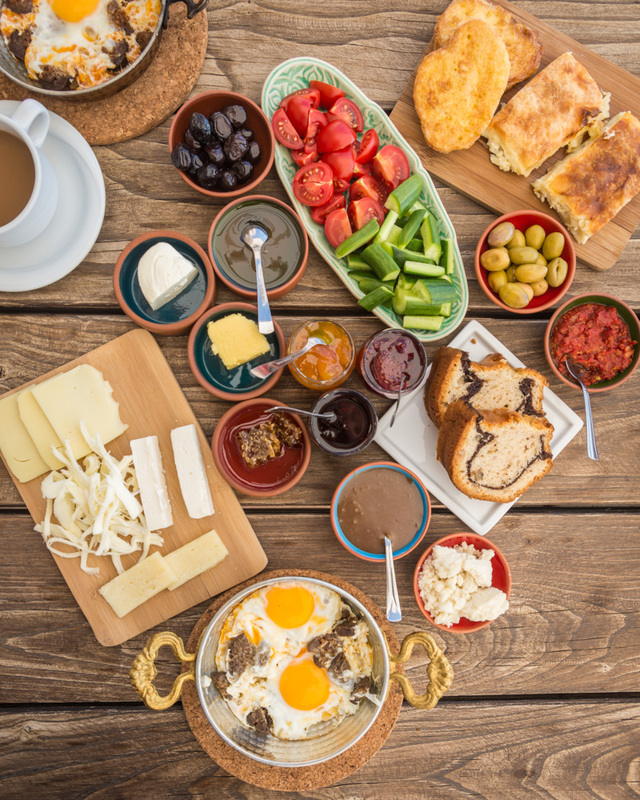 Then head to the dining room for a mouth-watering variety of breads, cheeses, jams, and traditional Turkish eggs with sausage. After an adventurous day exploring the underground cities, head back to this beautiful property and enjoy a glass of wine on your private balcony as the sky bathes the valley below in pink hues. Your cave room at Taskonaklar is your own little slice of paradise in Cappadocia. While out sightseeing around the city, you’ll find yourself daydreaming about tucking into your heavenly bed for an afternoon nap. It’s best to take your hot air balloon ride as soon as you get into Cappadocia as they are completely dependent on wind conditions. 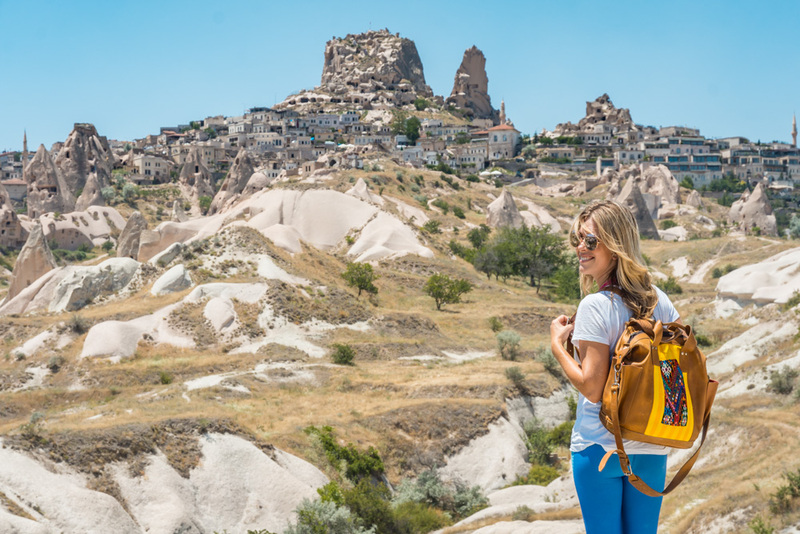 So if you wait until your last day, unfortunately your trip may get cancelled and you’ll miss out on the bucket list activity that puts Cappadocia on every Turkey itinerary. Taskonaklar can handle your booking on your behalf and they have one company that they recommend above all others; Ürgürp Balloon Tours. The tour will pick you up from your hotel bright and early at 3:40am to take you to their office for tea, coffee, and a light breakfast. Once everyone is checked in they’ll drive you to the spot where all of the balloons launch and you will watch as your balloon is inflated. They fit around 20 people in each basket so quarters are tight but everyone has their own railing space so no one will block your epic views of sun rising over the city. Your balloon tour will take you high above the city – 800 meters into the air. 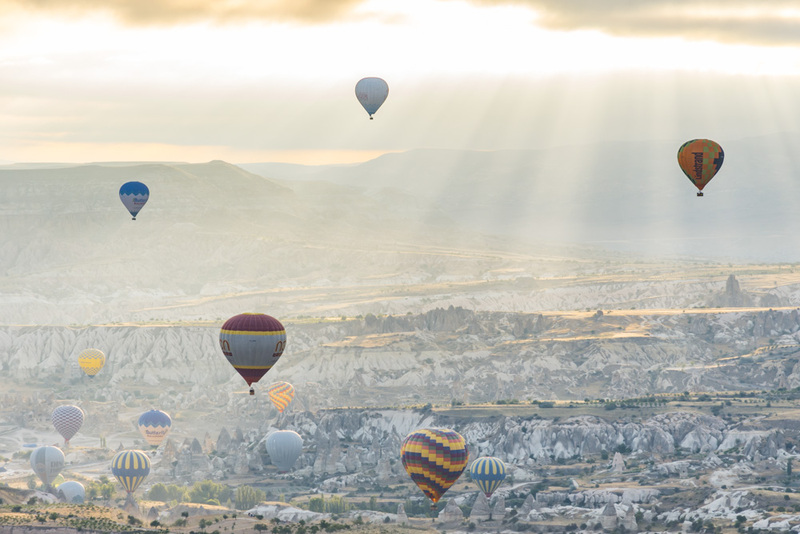 You’ll be surrounded by dozens of other air balloons and the sight is truly breathtaking. Depending on wind conditions your pilot may also dip you down into a valley so you can get up close and personal with the cave houses. The entire trip takes about an hour to an hour and a half. You’ll finish with a (nonalcoholic) champagne toast before being delivered back to your hotel for a nap and then a hearty breakfast at Taskonaklar. 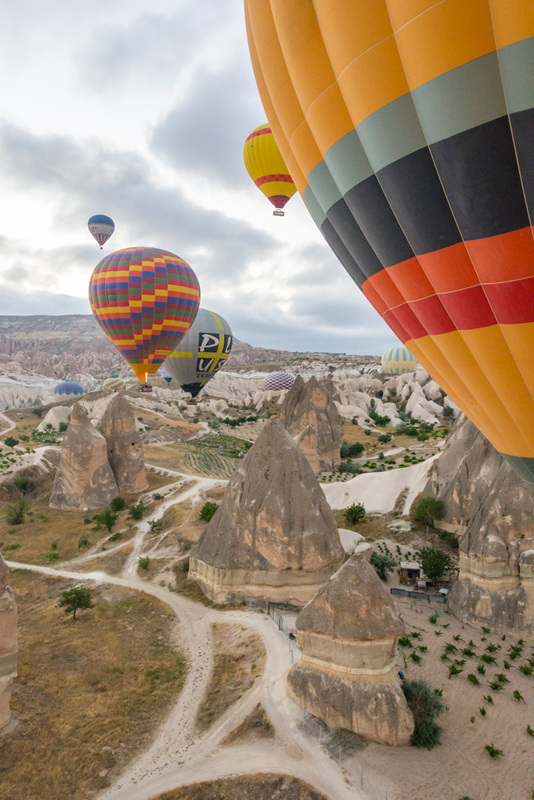 An absolute must-do excursion in Cappadocia! Once you’re refreshed from your early morning adventure, check out the little town of Uchisar. Stop at Capacity Travel to book a sunset ATV tour of Rose Valley where they will lead you through the maze of rough roads at the base of the valley and then finally to the best spot to watch as the rock formations turn a pale shade of pink as the sun sets. The sun sets late in Cappadocia so head over to Center Cafe near your hotel for a charming dinner in the garden before your sunset tour begins. 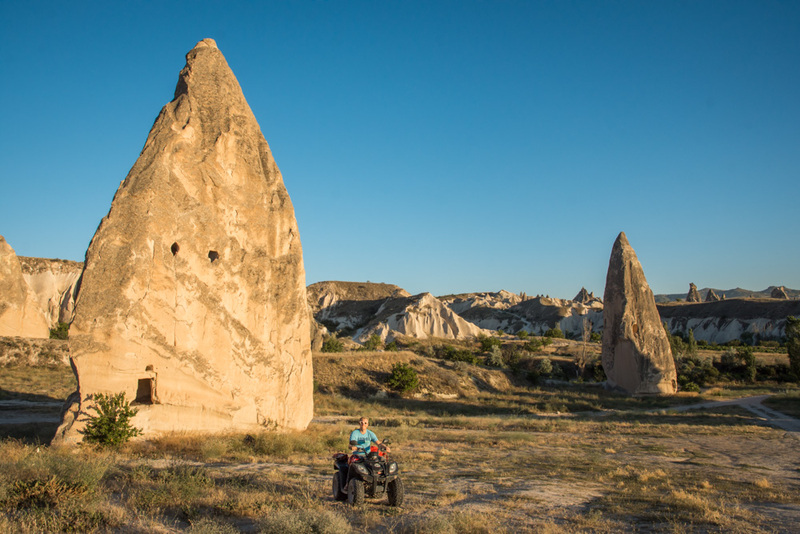 Take the road into Pigeon Valley from Taskonaklar and you will find a 4 kilometer-long well beaten path into Göreme. Well, actually, you’ll get a bit lost and a very friendly local named Ahmet will come to your rescue. 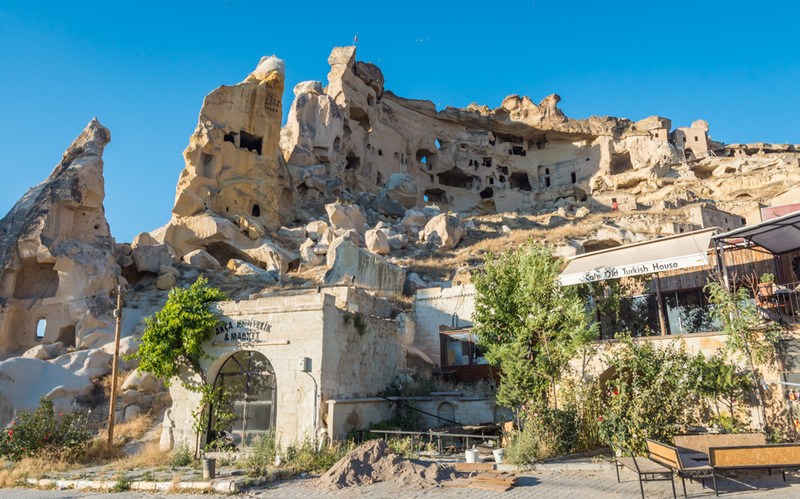 Ahmet will take you to a few scenic overlooks, you’ll stop at a few local spots for Turkish tea and eggs (if you’re not hungry you’ll be coerced into taking at least one bite), and finally ending at an old cave church in Göreme. He’ll expect a tip at the end of course so if that’s not your cup of tea give him a polite but firm “no thank you” when he first approaches you. A tip in the range of 20-50 lira should suffice. If you enjoy learning a bit about the plants of the area and having a darling local guide then you’ll have a great afternoon with Ahmet. After bidding Ahmet goodbye, have a stroll around the town of Göreme. Shop for air balloon souvenirs at the tiny shops on every street. Stop at Viewpoint Cafe and Restaurant for stunning views and cold iced coffee. Finally, rent a motorbike from Silk Road and cruise back to Taskonaklar for an afternoon siesta after your long day in the sun. Around 6:30pm, take the short 10 minute walk to the Uçhisar Castle to watch sunset from the top. This rock castle towers above the small town and there are many interesting cave rooms to explore both inside and around the vicinity. After your climb through the castle and to the panoramic lookout at the top, be sure to head around to the side where more great views await. On your way home stop at House of Memories for dinner. Start with the mixed appetizer platter and then try the fried beef for your main course. Grab a bottle of local wine in the wine shop directly below the restaurant and head home for a relaxing evening in your beautiful cave room. After waking for sunrise and then enjoying another delicious and filling breakfast at Taskonaklar, hop on your motorbike to check out a few famous sites around Cappadocia. There are 150-200 known underground and cliff settlements in the region and some were large enough to accommodate 30,000 people! There are two popular underground cities that are open to the public; Kaymakli and Derinkuyu. Kaymakli is a popular tour bus destination as it is the widest cave and is laid out in a loop so there is no need for large groups to pass each other in tight quarters. Derinkuyu is the deepest of the caves and is rich in history. It is thought to have been built during the era of 780-1180AD and was likely used as a giant bunker to protect the inhabitants from wars and/or natural disasters. Heavy stone doors on each floor allowed those inside to fend off intruders. If low walls and tight tunnels aren’t your thing, head to Kaymakli. If you don’t mind an enclosed labyrinth of tunnels then Derinkuyu is the more fascinating of the two options. It is approximately 85 meters deep with 8 floors. Imagine people living there; going to school, cooking meals, having church. And consider the intense amount of work that went into carving not only the massive tunnels but also the giant 55 meter deep ventilation shaft. On your back North make sure to stop at Paradise Valley for a quick stroll through the towering fairy towers at the base of Uçhisar Castle. When you’re finished exploring the underground city, head to Zelve Open Air Museum which was once one of the largest communities in the region. Take your time walking the 2 kilometer loop around the 3 valleys reading the signs along the way, wandering in and out of the churches and dwellings, and imaging what life was like in these shelters. It’s been a long day but if you’re up for one last adventure stop at The Church of Saint John (Vaftizci Yahya Kilisesi) which is an honey-combed cave church that rises above the small town of Çavusin. The rooms of the cave are interesting but the real gem of this site is the view from the very top. You can hike to the top on your own or hire a local guide and get some fun facts of the area for 10 lira. Stop at Sedef Restaurant in Göreme on your way home for the chef’s special kabab. And finally, spend one more evening lounging on your private patio at Taskonaklar. You’ve no doubt had a busy 3 days in the unbelievable region of Cappadocia! Planning a trip to Turkey? Check out our favorite travel guides! Next Post The Perfect Philippines Packing List! Definitely does look like you were in a fairytale! Can’t wait to visit it one day! Sure thing Julien! Thanks for reading! Oh wow. I love the look of Cappadocia and it is certainly on my list. Your hotel looks fabulous but also love the pictures. How awesome to do a balloon flight here! The balloon ride was pretty epic! I hope you make it to Cappadocia soon Anne! Very timely post as I’m going to Turkey from Georgia. Your photos are LOVELY. It seems very magical indeed. Oh good I hope this helps you to plan your visit! You’ll absolutely LOVE Turkey! Woooow… gorgeous photos! Flying on a hot air balloon is on my bucketlist and crossing fingers, I hope I do it in Cappadocia! You couldn’t ask for a better place for your first hot air balloon ride! I hope you get there soon! Hot air balloon, cave hotels and awesome Turkish food! Couldnt ask for more. But sadly just when I was planning the trip, there was civil unrest in Istanbul and we had to pull out. Will surely get there sometime. Love your header image with all the balloons too! Oh no! When was that? You should definitely try again, Turkey is such an amazing place and they definitely need more tourists there now! Never been in a balloon!! I guess it would be fantastic! I just met your blog and I really love your minimal style. I will keep following you!! Thanks Rocio! We do try to keep things simple. You’ve got to get up in a balloon – you’d love it! I’ve ridden in a hot air balloon, but we only went over a bunch of trees. The views from those hot air balloons looks absolutely fantastic. The city overall seems like a beautiful place to visit. You were right to say it’s like a fairy tale! Yes it definitely beat the hot air balloon ride that we did in Laos a few years before! Thanks so much for reading! I have always wanted to visit Turkey! I wish to go too. Your pictures are really amazing and you look really nice in that yellow dress. Thanks Karla! You should definitely visit Turkey someday – it’s amazing! 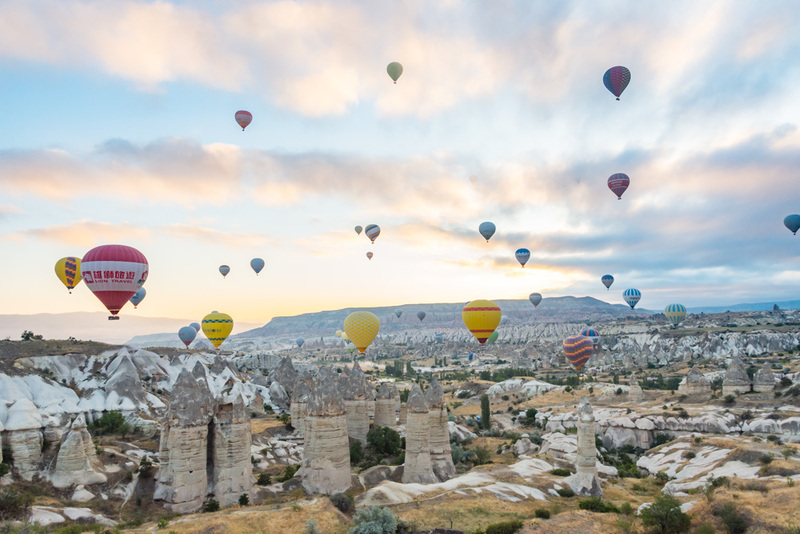 I’ve seen photos of Cappadocia’s fairy chimneys, and of the incredible hot air balloon rides, and ever since it’s been on my bucketlist. 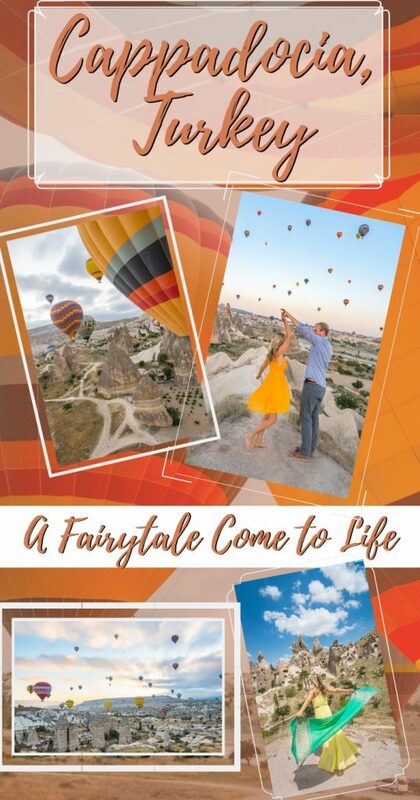 We recently visited Istanbul though didn’t have a lot of time so unfortunately couldn’t include it on our itinerary – though a flight + 1 hour bus ride I don’t think is too remote – definitely a once-in-a-lifetime modern day fairy tale adventure! I had no idea that you could stay in a cave hotel built directly into the rock – how incredible! Your room at Taskonaklar looks amazing, and it’s definitely where I’ll stay. I love that they can handle the hot air balloon booking on your behalf – I always prefer the local recommendations over what I manage to find online. Cool idea to also take an ATV tour – thanks for sharing your itinerary! Thanks so much for reading Meg! It is rather difficult to get to but certainly worth the trek – the landscape is like nothing we’ve ever seen before! I do hope you make it to Cappadocia in the near future to get it checked off of your bucketlist, I’m sure you would absolutely love it! The tourism industry is also really hurting right now unfortunately – apparently there used to be close to a hundred more balloons going up daily but so many have gone out of business. So the sooner you can get there the better! Cappadocia is like no other place in the world. The landscapes are so unique and look out of this world. The best experience of Cappadocia is probably that of floating high up in the air in a hot air balloon and feasting your eyes on the bewitching landscapes. Your pictures bring alive the wonderland that is Cappadocia in stunning effect. 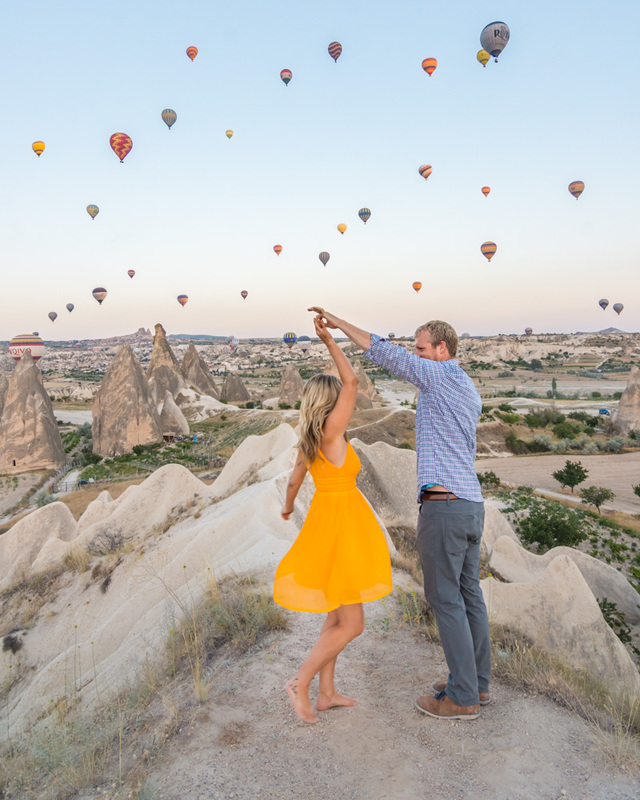 Cappadocia looks amazing, however unfortunately pregnant women are not allowed to fly in the balloons. Would you still recommend a trip to Cappadocia if the main highlight cannot be experienced?